Pura Erjeruk is one of the temples with high history value in Bali. 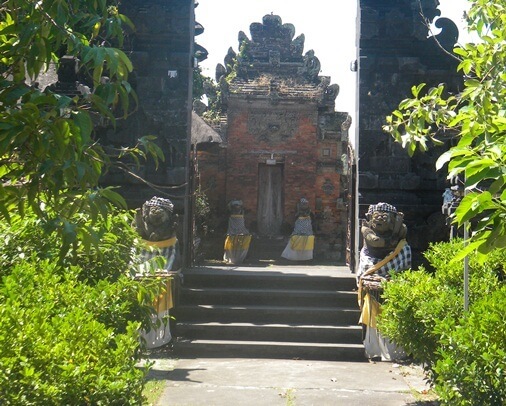 The temple is located in Banjar Gelumpang, Sukawati Village, District of Sukawati, Gianyar Regency, Bali. This place is accessible via the By Pass Ida Bagus Mantra. This holy shrine is located about 300 meters from the coastline in the south and surrounded by rice fields. Erjeruk Temple is situated in the area of Subak Cengcengan. Overall there are 13 Subak being "pengemong" or group of people that responsible for Erjeruk Temple. The temple is divided into three sections or Tri Mandala consist of "Jeroan" (inside or Utamaning Mandala), "Jaba Tengah" (the middle or Madyaning Mandala) and "Jaba Sisi" (the outermost or Nistaning Mandala). This temple has objects of cultural heritage of high historical value. This heritage objects is a structure shaped called Kori Agung. Kori Agung is the main entrance to the area of Utama Mandala. In addition of Kori Agung, there are also heritage objects that placed on Pelinggih Bhatara Ratu Brayut and Pelinggih Gedong Bumi. In the Pelinggih Bhatara Ratu Brayut are placed statues of male embodiment, female embodiment and rectangular reliefs that use decorative motifs. While on Pelinggih Gedong Bumi are stored embodiment statues in a sitting position. To get inside the temple, visitors are required to wear a cloth (kamben) and scarves (selendang). Many Hindu people come to this temple to pray, both from Sukawati village and outside the village. They did praying, pleading for agricultural crops can be successful, and also to invoke in order to obtain descendant as a family successor. From the temple the most part outside (sidewalk), visitors can see the blue beach on the south end. 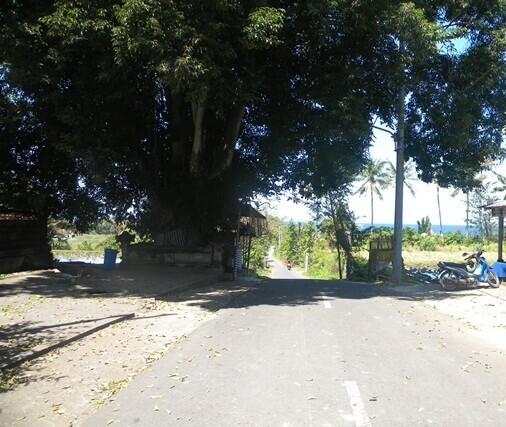 To get to the beach, just simply follow this path and enjoy the beautiful rice field along the way. 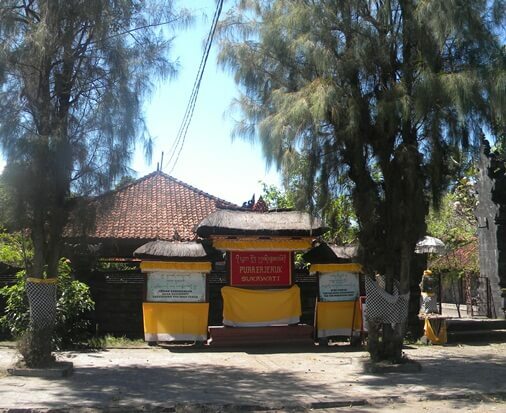 The existence of the holy temple is mentioned in the ancient lontar of Dwijendra Tattwa, which recounts the journey of the holy priest, Dang Hyang Nirarta, during the reign of Dalem Waturenggong in Gelgel, Klungkung (16th century AD). The priest walks along the southern coast of the Bumi Timbul (hereinafter known as Sukawati). He teaches "the procedure of planting" called "ngertamasa" to the locals. 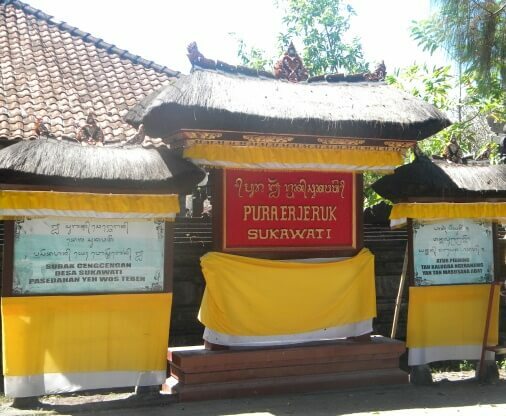 Before continuing the journey, he was pleased to make the shrine in Erjeruk Temple called Meru Tumpang Tiga (shrine with three overlapping roof).